Gather your family and friends, and come enjoy a free performance by Clave Gringa at Pfingst Animal Acres Park on Wednesday, August 8th, 6:30pm. Bring your picnic blankets, hats, snacks, and dancing shoes! 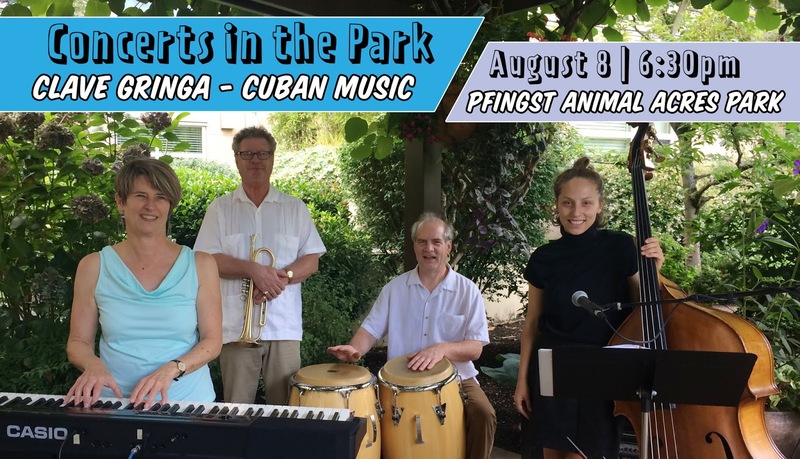 From the charm of the cha-cha-cha to the depth of AfroCuban rhythms, Clave Gringa presents a broad spectrum of Cuban music; original engaging compositions by Ann Reynolds as well as Cuban classics. The band includes Cuban musicians and musicians well-schooled in Cuban styles to provide an authentic Cuban sound. The Shoreline-Lake Forest Park Arts Council’s Concerts in the Park are always free and held at various community parks throughout Shoreline and Lake Forest Park on Wednesdays in July and August at 6:30pm (unless otherwise noted), rain or shine. Concerts in the Park are supported by the City of Shoreline, City of Lake Forest Park, 4Culture, Aegis Living of Shoreline, Jack Malek of Windermere, and by Arts Council friends and members. For more information and details, visit the Arts Council’s website or call (206) 417-4645.